Stitchingly Ever After [W6072] - $13.98 : Yarn Tree, Your wholesale source for cross stitch supplies. Cross stitch pattern by Barbara Ana Designs. 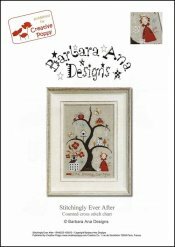 "Stitchingly ever after" is a beautiful tribute to needlework by Barbara Ana. It is designed to be signed by the stitcher (with an initial in the tiny hoop) and dated (at base of tree). The piece is a collection of sorts of stitcher's treasures, including a pincushion and emery bag, no fewer than 3 pairs of scissors, a hoop holding a stitched piece, a spool of thread and a tiny threaded needle. Birds, butterflies and flowers also grace the pattern. The lady stitcher and her cat stand at the foot of the tree. Stitch on #4138 Belfast Raw Linen. Stitch count 116 wide x 183 high.